Erborian Yuza Double Lotion ($36) a Yuza-enriched double phase lotion that provides radiance and nourishment to the skin. I like to use this lotion in the AM, as the first step to my skin care routine. The lotion absorbs quickly and boosts tired and dull skin. Erborian Ginseng Milk ($39) a milky lotion that is enriched with the moisturizing and smoothing properties of ginseng to help improve skin's texture. This lotion can be used in the morning or at night as part of your skin care routine to smooth the appearance of texture. I find that this product also shows immediate results, especially when worn under makeup. I even like to apply using a beauty blended it as a primer for my foundation. Erborian Bamboo Matte Lotion ($34) a Bamboo-enriched powdery lotion that's formulated to mattify the skin and reduce the appearance of large open pores. This unique lotion is probably my favorite from the line and can be used over makeup to "reset" it and mattify the surface of your skin. I love to use it on a beauty blender as a blotting tool and also carry a small spray bottle of the product to touch up my face throughout the day. Erborian Eau Ginseng ($39) a watery lotion used for hydrating, smoothing and refreshing tired, dull skin. This lotion can be used in the morning or at night, however, I like to use it as the first step to my night time routine. This lotion leaves a slight residue, and I find that it absorbs into my skin over night. 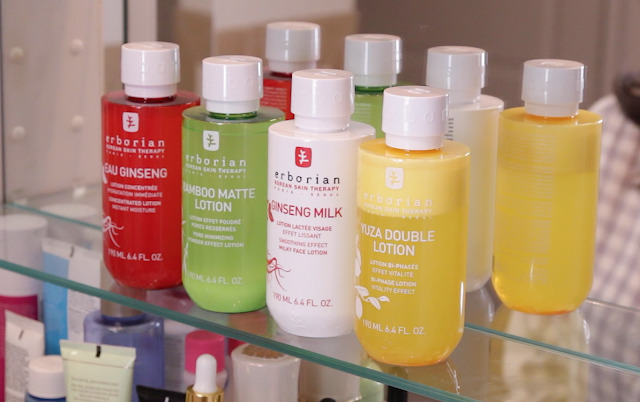 Erborian combines traditional Korean herbal medicinal practices with high-end luxury of French skin care creating groundbreaking products that are efficient and gentle on the skin. Check out the rest of the line at Sephora and watch my other reviews / tutorials for more!